Hajj group flying (kloter) 18 from Papua arrived on Thursday (09/13/2018) early morning in Makassar, flooded with pickers from South Sulawesi or South Sulawesi. “The number of pickers from South Sulawesi is because most of the West Papuan pilgrims are Bugis, Makassarese, Javanese, and other tribes in Indonesia,” said Secretary of the Hajj Organizing Committee (PPIH) Debarkasi Hasanuddin, Makassar Kaswad, as reported by Antara. He said, this group of 18 reflected the variety of tribes in Indonesia because there were indeed many tribes from Sulawesi and Java who had become West Papuans. 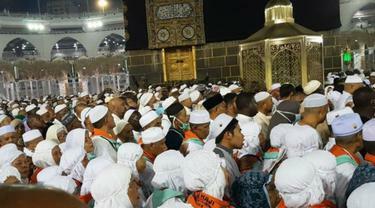 The number of pilgrims joined in the 18th group was recorded at 453 people. They consist of 447 pilgrims from West Papua, one pilgrim from Makassar City, and five pilgrims. According to Kaswad, the West Papuan pilgrims showed Unity in Diversity in all activities, including the pilgrimage. With the spirit of togetherness despite the different backgrounds of these pilgrims, Kaswad admitted that he deserved appreciation from all parties. “I think this needs to get extraordinary appreciation, in which their national and state consciousness has been implemented in life,” said Kaswad.